Hallmark Cards, Inc. is Lionel LLC's biggest licensee and it has been a good deal for both. Hallmark has released many Lionel commemorative pieces over the years, but the Christmas ornaments are the best sellers. The ornaments exploit the memories of Lionel trains and Christmas mornings that anyone over 40 remembers. The ornaments are sold just about anywhere – Hallmark stores, Walgreen Drug Stores and large food chains. So far, the list on each ornament has been under $20 and most have gone up in value. 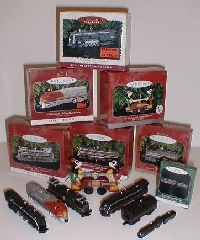 All have free-rolling wheels and the four Collector's Series locomotives have a series number underneath. So does the brand-new series pieces. Below is a list of the ornaments, along with both their original retail price. The prices in the second-hand market are all over the place. I've seen the Hudson ornament for as much as $80.00 in hobby stores, $50.00 at train meets, and $30.00 on eBay. Of course, market values increase around the Holidays. It should be noted that as far as we know, the possible absence of the perforated price tabs on the boxes have not been an issue for value. If you're going to start a series of ornaments based on Lionel locomotives, start with the best. The 700E got the series rolling in style. The model is decent. It measures approximately 4 inches. Some details on it are a bit big, such as the bell, handrails and drive rods but hey, it's an ornament. This one is by far the most collectible piece in the series. In terms of accuracy and detailing, this is the best locomotive of the series. Some collectors bought two to have matching AA units. On a Christmas tree, this ornament easily stands out among the rest. Instead of a model of the original 2332 5-stripe GG-1, this is the 18313 solid-striped version, the first Command-equipped GG-1. It would have been better to make a replica of the original. The pantographs look good and so does the keystones on the ends. This is not part of the series, but it is a Lionel-licensed item with Disney's approval. It's bigger in scale than the locomotive series, and you can move the two figures and the lever. The detailing includes simulated turn key and bell. A good model that includes the middle two blind drivers. They even improved on the original by putting numbers in the number boards. Something new this year. A companion ornament for the locomotive. It is not labeled as being part of the collector's series. After the holidays, the shelves seemed to have a few of these left and the Js were gone. Also interesting to note is that the modeler put the wrong trucks on the tender. The original 2046 tender had only four-wheel trucks. At least they put the long stripe on the sides. A new, smaller collector series was introduced in 1999. This time you get both the engine and the tender, but they are tiny, the locomotive measuring just over two inches. This is the start of a six-unit freight train and two different cars will be released this year and next.